BUY AN AUTOGRAPHED CD OF HOLLE THEE LIVE IN PARIS. $20 postage paid. You can download the song, “It’s All About You”, Holle performed with Clarence Daniels from his album Players Choice here from Amie Street. The current price of the download is free. 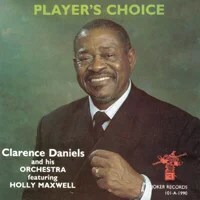 If you enjoy the song, you can purchase the Clarence Daniels CD (featuring Holle Maxwell) from CD Baby or iTunes . Holle Thee Maxwell was born on October 17, 1945 as HOLLE THEE MARCLA RODE’ MAXWELL. She recorded singles under the name “Holly Maxwell” in the 1960s-1970s for the record labels Constellation, Curtis Mayfield’s Curtom Records, Smit-Whit, and Star. Her songs such as “Only When You’re Lonely”, “One Thin Dime”, “Never Love Again”, “Suffer”, “Philly Barracuda” were regional hits across the country.